Seaford Town Council welcomes the new Mayor of Seaford! 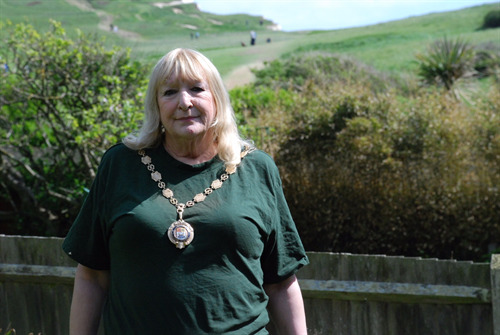 On 12th May Seaford Town Council held its Annual Meeting, a meeting held every year in May to carry out certain required business including the appointment of a new Mayor for the town. The Council is pleased to announce that Councillor Lindsay Freeman was appointed as Mayor of Seaford for this coming Municipal Year. Councillor Freeman is now in her second year of office as a Town Councillor but did also serve a four year term back in 2003-2007, so has a good sound knowledge of Seaford and how the Council operates. Councillor Dave Argent who has carried out the role of Mayor of Seaford for the past year handed over the Mayoral Chain and was thanked for all his hard work, dedication and achievements during his time in the Mayoral office. The Council also extended its thanks and recognition to the former Mayoress, Mrs Marian Argent, for all the support she gave the Mayor during his service. In reaction to her election, Councillor Freeman said “When I first came to Seaford to study to become a Home Economics teacher, little did I think that years later I would become Mayor. Seaford became my home and although I moved away, I kept returning and have lived here since 1982. It's an honour to be elected as Mayor and I will do the best I can for the whole Town." Also at the Annual Meeting, Councillor Carol Campbell was elected as Deputy Mayor to deputise for the Mayor in their absence and also attend events and functions alongside. Councillor Campbell is also in her second year of office as a Town Councillor and as the Chairman of the Community Services Committee, has a real passion for maintaining and improving the town of Seaford for its residents and visitors alike. At this meeting Jessica Batchelor was announced as Young Mayor of Seaford for the forthcoming Municipal Year, having acted as Deputy to former Young Mayor Gabrielle Edwards. Jessica has some exciting ideas for ensuring the youth of the town have a voice at Town Council level and feel represented. Jessica is also a member of the Youth Parliament and Youth Cabinet. Watch out for announcements regarding the Mayor’s and Young Mayor’s upcoming events as the new Mayoral appointments get underway in office! 2016/17 Mayor of Seaford, Councillor Lindsay Freeman. 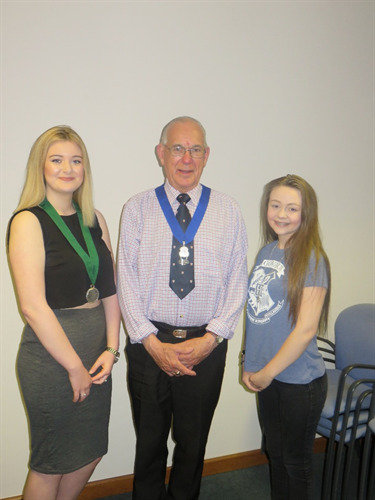 Young Mayor of Seaford, Jessica Batchelor; Former Mayor of Seaford, Councillor Dave Argent; Former Young Mayor of Seaford, Gabrielle Edwards. 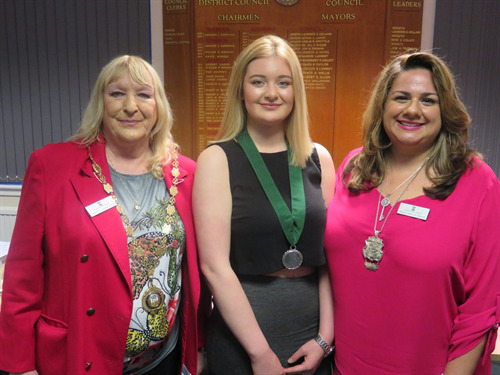 Mayor of Seaford, Councillor Lindsay Freeman; Young Mayor of Seaford, Jessica Batchelor; Deputy Mayor, Councillor Carol Campbell.